← My new column in Weekly Trust. First installment. 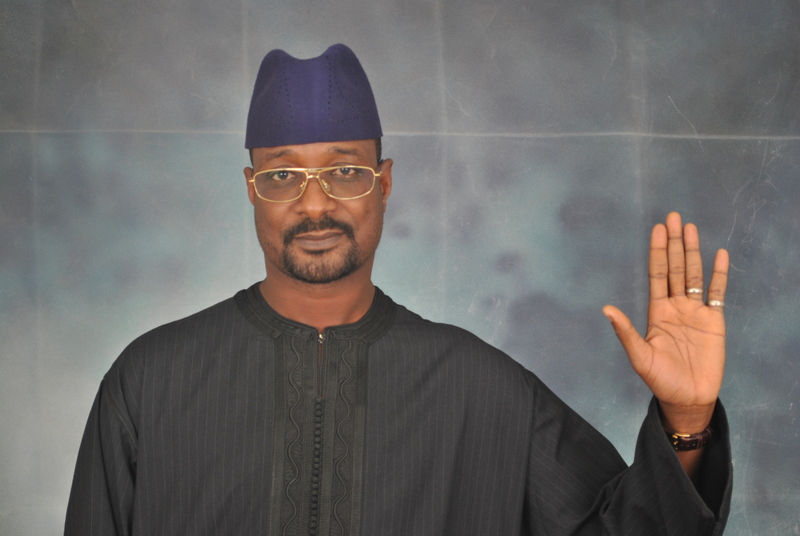 In breaking news, the Hausa director and former gubernatorial candidate, Hamisu Lamido Iyan Tama has dropped his lawsuit for defamation against Abubakar Rabo Abdulkarim, the Director General of the Kano State Censorship Board in exchange for the board’s dropping of charges against him in a case that has dragged on for almost two years. said the trial was “improper”, “incomplete”, a “mistake” and requires retrial before a more “competent magistrate”. 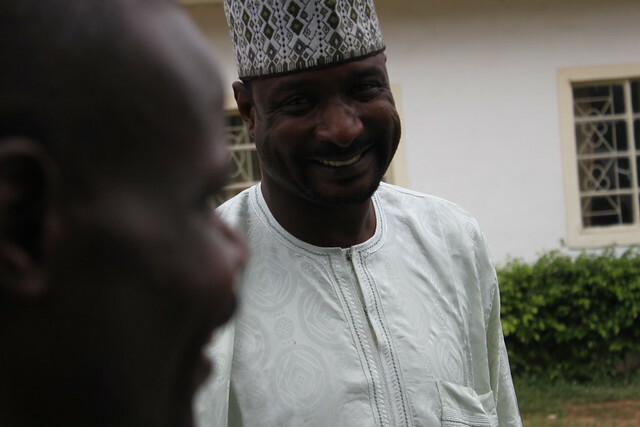 The DG was dragged before the court by Iyan-Tama, who alleged that he had defamed his character in a television interview he granted DITV Kaduna earlier this year, when he allegedly stated that Iyan-Tama Multimedia was not formally registered as a moviemaking business enterprise. 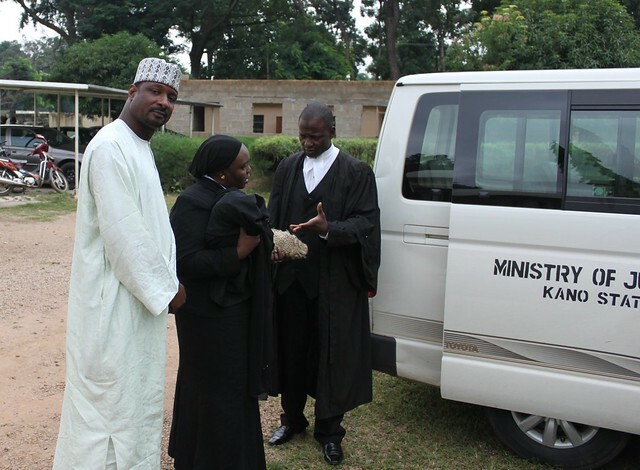 The court had sat twice without Rabo, before it subpoenaed him to appear in person after a request from the plaintiff’s counsel, Barrister Muhammad Sani Katu of solicitors Mamman Nasir and Co.
Rabo, who appeared to be limping yesterday, arrived the court at 9:05 a.m. in a Toyota bus belonging to the Kano State Ministry of Justice. He was accompanied by two state counsel, Rabi Waya and Sanusi Ma’aji, as well as the chairman of the censorship board, Malam Rabi’u. He had never answered a court’s summons in the many legal cases filed against him by various movie practitioners in Kano and Kaduna during the past three years since he was appointed by Governor Shekarau to sanitise the film industry. For more details of the “hot words” exchanged between the lawyers of the two parties, read the rest of Tonga’s article. The resolution was reached as a result of consultations between my lawyers and that of Rabo where some terms were agreed upon. After we filed the case before a Kaduna High court over alleged defamation, claiming N10 million damages and Rabo failed to appear during the first two sittings saying his security needed to be guaranteed, my lawyer prayed to the court that it was important the defendant appeared and the court granted the plea by way of ordering that Rabo appeared while it guaranteed his security. […] My lawyer insisted that if I will have to withdraw the case, the censorship board will also have to withdraw its case against me which has been pending for quite a while at a Kano magistrate court. The first was that my company, Iyantama Multimedia was registered as a business name [… with] a certificate of registration KN/0010927 dated the 16th day of December 1997. The second term was that the defendant’s statement that led to the suit was based on a search report made at the corporate Affairs Commission for a limited liability company, and thirdly, that the parties in the suit have in pursuance of the pre-trial conference conducted on the 28th day of September, 2010 resolved to terminate the suit and the criminal case pending before Chief Magistrate Court 7, Nomans Land between the Kano State Censorship Board and Iyantama with case number KA/CMC/28/08. was not operating illegally. 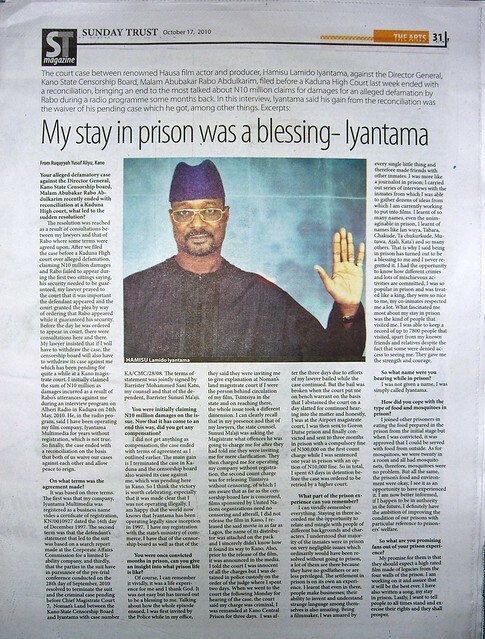 I am happy that the world now knows that Iyantama has been operating legally since inception in 1997. Iyan Tama also talked extensively on the events leading to his imprisonment and his experiences in prison. Being a filmmaker, I was amazed by every single little thing and therefore made friends with other inmates. I was more like a journalist in prison; I carried out series of interviews with the inmates from which I was able to gather dozens of ideas from which I am currently working to put into films. […] That is why I said being in prison has turned out to be a blessing to me and I never regretted it. I was not able to find a link to the Sunday Trust article online, but I have scanned in a photo of the article on flickr. If you click on the photo below, it will take you to a version large enough to read onscreen. This entry was posted in Abubakar Rabo Abdulkarim, Hausa film, Iyan-Tama, Kannywood, Kano State Censorship Board, Law in Northern Nigeria, Nigerian film and tagged Abubakar Rabo Abdulkarim, defamation, Hausa film, Iyan-Tama, Kano State Censorship Board, law, lawsuit, settlement. Bookmark the permalink.